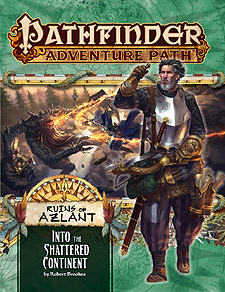 After working to secure their settlement on a surviving fragment of the lost continent of Azlant, the adventurers aid the colony by exploring the rest of the island to search for resources and look for potential dangers. Soon they learn of a sea hag whose attempts to revive the powerful oracular powers of the Azlanti threaten the island's inhabitants. But an even greater peril confronts them as they begin to notice that some people in the settlement are acting strangely—a haunting echo of the clues left behind after the original settlers vanished. Sinister forces are at work in the colony, and the adventurers must uncover a menacing threat to the settlement before they become the next victims of a vile plot. "Into the Shattered Continent," a Pathfinder RPG adventure for 4th-level characters, by Robert Brookes. A gazetteer providing a look at some of the history, interesting denizens, and points of interest in the region where this story unfolds, by Adam Daigle. A collection of rare magical treasures from ancient Azlant, by Ron Lundeen. A bestiary full of monsters that inhabit the islands, by Ayla Arthur, Robert Brookes, Lucas J.W. Johnson, Robin Loutzenhiser, and Mark Moreland.